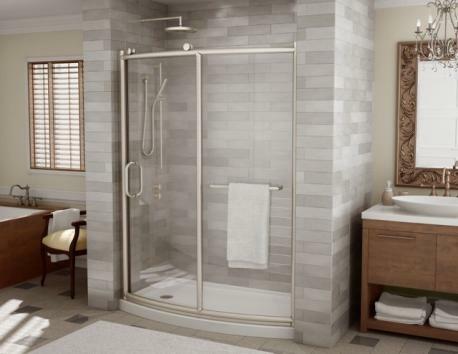 Updating a bathroom is much less complicated than one might imagine, especially when it comes to bathroom showers. While it’s true that most folks have little choice but to make do with the existing tub, toilet and sink, there are still plenty of creative ways to make even the most mundane of bathrooms look fabulous. The best way to begin any makeover is to remove everything from the room including the window treatments; this is best done in daylight so you can really see what you are dealing with. Take the time to review what you have and donate or discard anything you no longer use or want – by simply eliminating clutter and extra stuff you have less to worry about storing and more space to work with. Clean the room from top to bottom and make sure to clean any windows, mirrors and light fixtures; this is an ideal opportunity to switch to energy efficient light bulbs if you have not already done. Use glass and hard surface cleaner on all metal hardware and bath fixtures. If the tub or shower looks dated but you are not ready to renovate you can still do an easy upgrade; simply invest in a tub and shower trim kit which includes a bath spout, showerhead and flange. This will add a whole new look to your tub or shower enclosure; most can be installed without the help of a professional. Another easy improvement is the addition of a handheld showerhead; most models can be installed using ordinary household tools. With a handheld showerhead you can target the water spray precisely where you want it – this makes it easy to shampoo hair, bathe children, wash pets, water plants and clean the tub or shower enclosure. Dated vanities and bath cabinets can be transformed with new hardware and all it really takes is a screwdriver to remove and replace most drawer pulls and knobs. Coordinating shower curtain hooks and contemporary drapery hardware can help to make any bath or powder room look more attractive while the addition of decorative towel bars, robe hooks and towel rings adds functionality. Add bath furniture such as a teak shower bench or bath mat for a spa-like touch. Vessel sinks, towel warmers and other upscale amenities are something you can aspire to own in the future but why not enjoy your bathroom in the meantime. With just a small amount of elbow grease and imagination you can transform your bathroom into a stylish oasis.